Anniversaries are an occasion for both looking back and ahead. Recapturing fond memories, learning from the past, planning for a future. In 2016, the Bemis Center for Contemporary Arts enjoys its 35th year as an organization, and has opened its annual exhibition season with Time + Space: Beginnings, which considers its early years as well as its evolution as a visual arts laboratory by featuring work of past residents interspersed with historical materials. In its inception, Bemis was an artist-in-industry program, allowing for explorations of scale, materials and collaboration beyond the studio. Establishing a home at the former Bemis Bag Building at 11th and Jones Streets, it committed fully to the artist-in-residency program that remains at its core. It also boasted exhibition space and, a bit like a pendulum, Bemis has swung through the years along the “line of pull” of its mission: to provide artists with private time to explore their creative ideas freely, and to offer the community a space in which to view contemporary artwork. So it is fitting in some respects that this exhibition is given a framework around a swing, which hangs in the center of the first of two galleries housing the show. 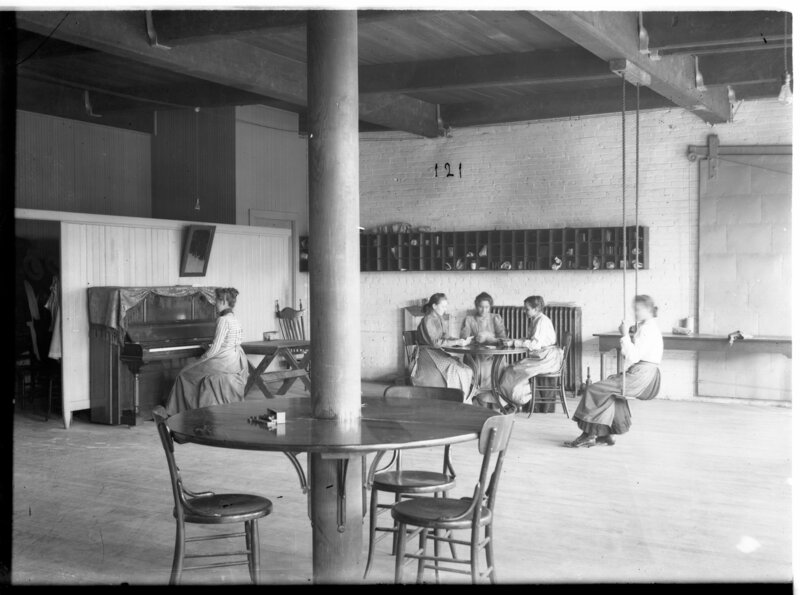 It was inspired by a 1916 photograph by Louis Bostwick of a women’s recreation room in the original Bemis Bag facility, itself artfully staged to promote a national corporate wellness; a parallel image from the men’s side hangs in an adjacent gallery. Visitors are encouraged to ride on this swing, which faces either the Bostwick image reproduced as a photomural or a wall of sky-themed artworks by past Bemis residents Angela Drakeford, Nicolas Ward and Derek Coté. Extending the metaphor is a video by Lauren Kalman capturing the performance of a naked, hooded woman suspended from the ceiling by a white rope, twisting silently more like a piece of meat than a gymnast. In reality, the swing is a departure from yet another conceptual driver of the show, an emphasis on artists working in clay and sculpture. Among Bemis’ founders, artists Tony Hepburn, Jun Kaneko and Ree Schonlau all had deep roots in the American clay revolution and early on established the Center as an experimental hub with great facilities for ceramics. Several drawings by Hepburn as well as a stacked column sculpture from 1982 illustrate these first moments, as do a set of plates marking collaboration between Michael Sarich and Brook Levan. Given the international prominence and community legacy that Kaneko has since forged in Omaha, you might expect a greater presence for his work in the show. However, with what must have been a curatorial eye toward balance, he is represented by a signature yet unassuming small wall slab plus many unlabeled photographs of the artist and others working in massive beehive kilns on his early large-scale “Dango” sculptures. Generally, past as prologue infuses the entire exhibition, because the works making up the show date from the entire history of Bemis’ program, although their progression is entirely non-linear. Beyond the medium of clay—the material of earth—many works feature the landscape and the human relationship with it. Only a few could be described as “traditional” in approach to landscape imagery: Mike Calway-Fagen’s “future plans for a prior night” captures a pond at twilight with a string of lights dancing reflections across the near horizon. Reminiscent of Alfred Stieglitz’s classic “Equivalents” photographs, Nicolas Ward’s small “River and Cloud” graphite drawings on Mylar look at formations in the skyscape. Interaction within or about the land informs more of the show’s works. In Liliya Lifánova’s performance “Flying Carpet Project”, captured in a photograph by collaborator Rosana Camára, the artist appears to roll up a bale of hay, as if it were a rug. Rodrigo Valenzuela’s “Meditations on Land” is a slow-motion black-and-white video focused on the rhythmic, sifting hand motions of an individual literally buried in sand. The motion-activated “Dustbowl” by Wes Heiss consists of a 33rpm record on a working turntable playing howling wind noise recorded in Roswell, New Mexico. Next to it is a glass dome containing a small amount of sugar; a motor at its bottom spins along with the turntable, creating a miniature dust storm. Or, at least, when the display has not run low on sugar. Rounding out the exhibition are additional unlabeled archival materials. A light table full of slides showing past Bemis educational programs with children is a bit telling, as this aspect of programming has faded in recent years from the organization’s profile. Frankly, visitors unfamiliar with the long history of Bemis and its major role players will find themselves at something of a loss in understanding the historic items, though additional reading materials are available in a niche between the two main exhibition halls. As a whole, the exhibition’s polarities of past and present, of earth from above and within, of conceptualism and historicism are a metaphor for Bemis as an artistic pivot point. Put simply, it don’t mean a thing if it ain’t got that swing.